Designer Alexander McQueen was found dead today at his home in London, in an apparent suicide. He was 40 years old. You can read more at the Guardian, the BBC, or the New York Times. Tell me this is a joke, a prank. Oh my God. Why? Why??? Gosh, how very sad. RIP. What sad news, and yet more proof that boatloads of talent doesn’t make one immune to… well, anything. I was stunned when I found out this morning. Heartbreakingly sad. Rest In Piece, you genius. I just heard this about a half hour ago. I’m so fashion-clueless that I’m not so aware of his work even though I know the name by way of perfumes. RIP. I can’t say that I follow fashion closely, but his work had an incredible sculptural quality. Pulling from catholic sources, he was always pushing imaginative new shapes, while never forgetting the person within the clothes. His collections seem to follow his own personal interests rather than trends, but his craftsmanship and focus on the body always kept him commercially viable. Perhaps I’m reading too much into it, but his fashion suggested a rich interior world, occasionally touched by various religious traditions, and the accompanying darkness. By all accounts he was a creative force and a master craftsman – a real tailor. his spring 2010 collection eroded some of my cynicism about fashion. Oh, and how can I forget the shoes? Very beautiful wording, Abirae. This is sad indeed. I’m shocked. I don’t pay much attention to fashion (I mostly know of him through his scents, like the polarizing Kingdom), but you couldn’t really avoid hearing about him in relation to Lady Gaga, who famously wore his clothing to such good effect in her “Bad Romance” video. Judging from that collection alone, he was obviously some kind of genius, and I am sorry to hear of this. They called him “l’enfant terrible” in the fashion press but I think he just had a wicked sense of humor and liked to take the piss out of the pretentious fashion elite. But this boy was obviously not so terrible that he was obviously gutted by the passing of his mother a few days earlier. It just makes the event all the more tragic to me. I really am feeling for his poor family to have to suffer two losses so narrowly spaced. His vision, creativity and inmensurable talent will be greatly missed. Kingdom was one of my favorite fragrances. Very sad news, indeed. His work was so good. I was just admiring his latest collection last night. This is so sad and I feel for his friends and family. RIP. Thanks to everyone who chimed in — it is very sad news. I found out hours ago but I’m still at a loss. It is so tragic that someone could be so devastated that they couldn’t just wait a little bit longer….I can’t help but think that his mom would be horrified to think that he ended his life because of her loss. I feel so badly for his family to lose so much in such a short time! This is profoundly sad. Any loss of such a young person is unimagineable….heartbreaking…. Loved his theatrical creativity – hated the armadillo shoes – a great loss to the pressure-cooker world of designer fashion. How terribly shocking , he was so young and talented. A great loss. So sad and shocking. I loved his clothing and vision. Rest, Lee. Wearing Kingdom today to honor him – his work was incredible. I keep seeing SJP with him in that amazing plaid dress, and she wore a gorgeous black satin sheath of his last year. It had a silkscreened tendril of smoke wafting up the bodice. 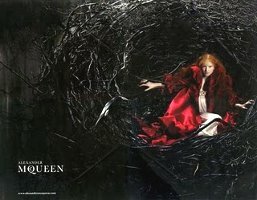 Alexander McQueen, I miss you already! Kingdom was first perfume that was pure magic to me. It was such a puzzle – romantic and gothic and the sexiest thing I’d yet smelled in my life. It was Kingdom that drove the academic in me to learn why it was so intoxicating. The romance came from rose and jasmine, the gothic came from the myrrh and the sandalwood, and the sexiness of warm skin came from the cumin. I bought Kingdom at Harrods when I was running the London marathon for the first time, and it will forever remind me of a time in my life that was full of beauty, wonder and possibility. Thank you for an incredible gift. Although I now know designers have little to do with actual fragrance creation, Kingdom still holds a special place in my heart because it was the beginning of my journey to becoming a perfumista.